Dogs love to eat, and anything you put in front of them will be gone within seconds, but sometimes they can be allergic to certain foods. Dogs don’t know what allergies are and just know that the food they eat is tasty so it is our responsibility as the parents to notice if our furry friends have dog food allergy symptoms. These symptoms are not the only things that can happen but they are common visible signs that your dog may be having an allergic reaction to food. If your dog is one of the ones that is allergic to something they eat there may be some common symptoms that accompany this problem. Some are more apparent than others but all can cause discomfort in you furry friend to the point where they may need treatment. One symptom could be an infection in your dog’s ear, this leads to itching or even pain that can be an extreme annoyance for your pet. Dogs who deal with this often shake their head or scratch at their ears constantly. They have also been seen attempting to groom themselves more frequent than usual. If you notice these behaviors check your dog’s ears, If there is a build up inside that is a brownish color it is a buildup of yeast that is a side effect of ear infections caused by dog food allergies. Along with this there may be an odor associated with this that may be your signal to get them checked. A veterinarian can help deal with the ear infection and will oftentimes prescribe ear drops or other drugs to fight off whatever is happening. Another common dog food allergy symptom is itchy skin. One thing that reoccurs with any allergies is the presence of an itch. Itching can be a symptom of many different problems and allergies are on that long list. These dogs will often go out of their way to itch and scratch every inch of their body. This could mean rolling or rubbing on anything that feels good. Because Itching is so common as a symptom it may be hard to decide if a food allergen is in play. This is a bad side effect for sure but on its own may not be a clear sign, look for other common dog food allergy symptoms to make sure this is what is going on with your furry friend. 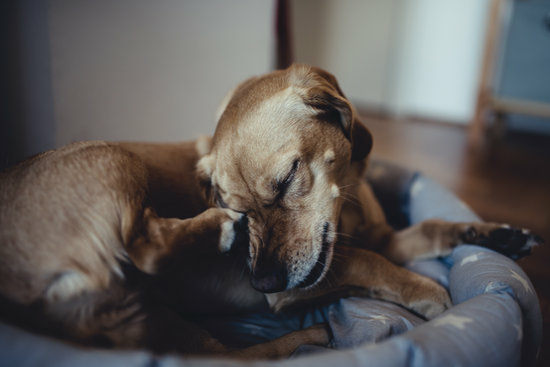 Luckily because it is so common there are plenty of ways to help your dog’s itchy skin. Some of our favorites are coconut oil and salmon oil. Both of these natural remedies have additional benefits that help boost your dog’s skin and health problems. Previous Post New Year, New You, New Dog!